Take control of what you drink today! Soda Plus has the ability to carbonate anything you drink! 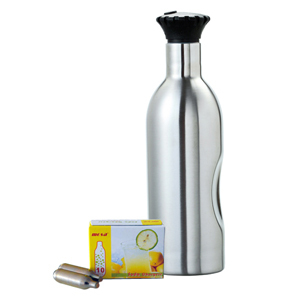 This amazingly simple home soda carbonating system allows you to infuse CO2 into any liquid placed into the canister. Instantly you can make sparkling wine for a romantic picnic, healthier alternatives to store bought sodas and flavorings, and the Absolute best sparkling orange juice and lemonade your family has ever experienced. The beauty of this home soda system is that it is unlike any other home soda machine! There is no need to flavor water to get the desired affects of homemade soda. That soda still has all the chemicals as the soda in the store. This beverage carbonating system allows you to carbonate anything! The Soda Plus hame made soda system is available in as a starter kit with a 10 pack of CO2 chargers. The system and CO2 chargers can also be purchased separately. CO2 chargers can also be purchased by the case. This Home Soda System Is A Perfect Alternative To Store Bought Soda Machines.